British DJ Jacob Plant has been commissioned to remix songs by Rihanna, Calvin Harris, Iggy Azalea and other big name artists, but his most recent video for his song “About You” depicts a muscular young man whose body gradually gets taken over by a creeping rash of rainbow glitter. 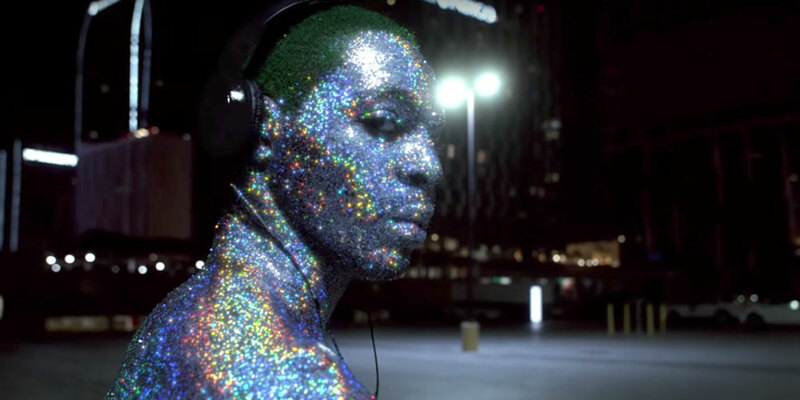 We’re unsure if the glitter rash serves as a visual metaphor for diversity or uncontainable self-expression, but either way, it’s dazzling and we can’t stop watching. 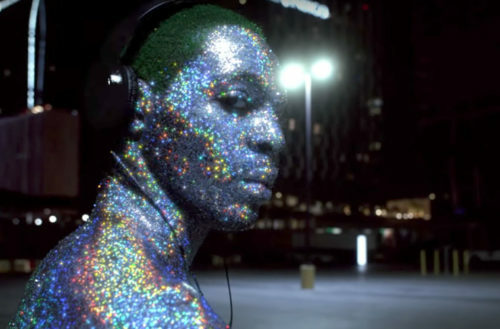 It took about an hour for professional makeup artist Lavonne Anthony to apply glitter to the entire body of Matthew Gibbs, the dancer who appears in the video. The song’s beat grows more urgent as the glitter-covered man feverishly looks for medicine at his local convenience store. He has a compassionate girl friend in the video, but it isn’t clear if the two are romantically linked. She takes him to a parking lot where she meets Plant, who has a collection of tapes in his car. Plant makes him listen to “About You” and when we see Gibbs again, he’s covered completely in glitter and dancing. His green hair and shimmering silver body make him look like the love child of The Joker and Colossus from The X-Men, but we love it. The video is a definite improvement on Plant’s first video “Bike Engine” which featured a bunch of legless men trying to ride a scantily clad pair of female legs like a mechanical bull. Midway through, a bunch of legless women organize a protest against the offensive music video and are mocked by a muscular man dancing around in a silver Speedo. When the video’s director sees all the angry online criticisms of his work, he lies awake in bed and sheds a single tear. Hardly inspiring.